The large outdoor area combined with the owner's enthusiasm for outdoor pursuits help to make it an ideal setting for activity breaks as well as Country Pursuits and also the hotel can cater for up to 20 people or larger gatherings of up to 100 people meaning it is also perfect for Corporate Quizzes and Race Nights. Northern Ireland offers a great range of Special Interest Activities to the enthusiast but there is nowhere quite like the Antrim Coast for unspoilt beauty. The scenic Coast Road stretches for 32 miles with unfolding scenes of green Glens, limestone cliffs and majestic coastal views. The area provides the perfect setting for activity and touring holidays. Carnlough is situated at the foot of Glencloy - one of the famous Nine Glens of Antrim. The village itself surrounds a sandy beach on the south with the old part to the North beside the sheltered harbour. 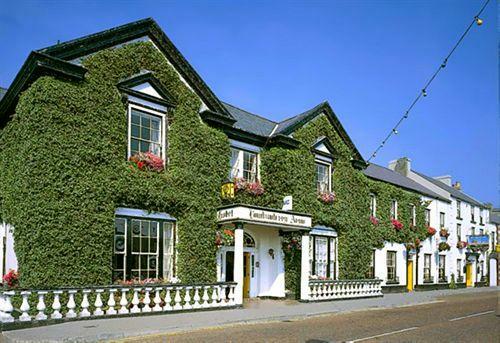 The Londonderry Arms Hotel has been owned and managed by the O'Neill family since 1947.